Can't make the open house, but you'd like to see the home? Call/Text me at 253-226-2787 and we can schedule an appointment. Calling all Victorian lovers. Let this Historic North Slope home tell you its story while 11 foot ceilings soar. Fall in love with the open staircase, hardwoods, clawfoot tub, renovated kitchen, and original millwork. Window light and firelight, cased openings and covered porches. Outdoors a tranquil urban oasis of stone pathways, blossoms and berries awaits. Walk everywhere from here! It's just 5 minutes out the door on foot to the beloved 27 acre Wright Park and Stadium! Park in the detached garage, or use permit parking available to residents right out front on K Street. Refinished oak floors glow underfoot, 11 foot ceilings rise overhead, and an open staircase shows the way to the upper floor. In the living room, a bay window gathers light, while the mantle, tile hearth, and inlaid hardwoods draw you toward the gas fireplace. Hardwoods continue into the dining room with its chair rail and picture rail molding, chandelier, and tall windows. The kitchen is adorned with gleaming hardwood floors, custom white cabinets, a divided farmhouse sink, stainless appliances, gas stove, and hood vent. Generous counter space, hanging light fixtures, and those same high ceilings with tall windows make the space functional and charming. Both a laundry room and covered back porch are adjacent with a 1/2 bath nearby in the hall. Head up the staircase to the landing that gives you the first glimpse of the wide-plank fir floors covering this level. Two bedrooms overlook the back yard and beyond with picture rail molding, 11 foot ceilings (yes, on this floor too! ), and warm color scheme. A third bedroom includes a light-filled dressing room (or art space, reading nook...). 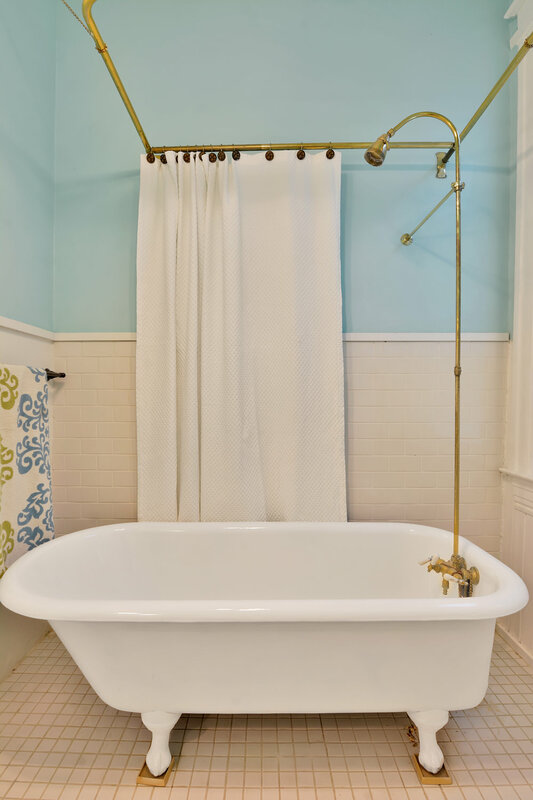 The full bath has Victorian flair with its refinished clawfoot tub, wainscot, and storage closet, while the island blue walls, and white subway tiles give it a touch of the modern. From the jasmine scented front porch, step out for a walk to Wright Park or Stadium Thriftway. Hanks with its renovated polished wood interior and beautiful patio is just 2 blocks away! This Victorian home, a treasure remaining from 1890 is set in Tacoma's Historic North Slope District. Many who know Tacoma well are giving a small sigh filled with pleasant memories of wandering these blocks on summer evenings while cats watch from the windows of homes quaint and grand. Think of garden paths, wide front porches, deep eaves, pleasant doorways, and glimpses of private backyards. Walk everywhere, drive easily when you're in a hurry, take the bike out; you won't go far to find a cup of coffee or a cocktail, Saturday brunch, or independent film. Take a look at some walking and driving times to some Tacoma favorites within easy reach. Gardens extend to street corners and planting strips. This One Is Mine or... This One Is Herbert's? There's a lot more to say about this home, and much more to see. Take a look at our full listing blog post for more photos details about this Historic North Slope Victorian. For more information, call or text me at 253-226-2787. I'll be happy to answer your questions about this home or the Tacoma real estate market in general. I hope to see you at the Open House this Thursday, July 26th from 5 - 8 pm. Have a great week! Newer PostWelcome to August - 21 Tacoma Events For You!